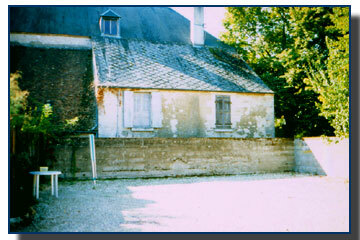 In the novel the Hôtel de l'étoile is renamed Hôtel de la Loire. The present-day owner of the hotel Mrs. Carla Harrison, an English lady who resided in Africa for a long time, decided to follow the author on this and called the lodging Hôtel de la loire. There even is a Simenon-room. Through the research of Claude Menguy, who talked to the previous owner M. Boursin, we know that this is the room Simenon occupied in 1937 and in which he wrote the "roman dur" Les Soeurs Lacroix. 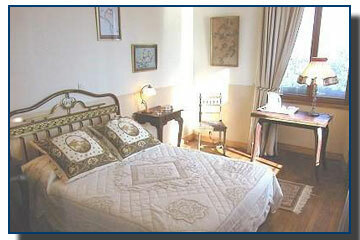 The hotel internet site, mentions, uncorrectly, that two novels were written in this room, among which M.Gallet, décédé. This is impossible. 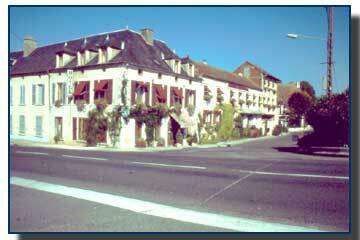 Simenon only stayed in the hotel in 1923 and in 1937 and the novel was written in 1930 in Morsang-sur-Seine. As is well known, the author never wrote about the locality he stayed at while writing. This entry probably concerns a misinterpretation. 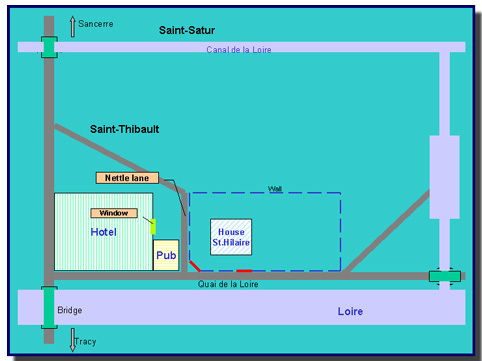 The hotel is exactly on the spot Simenon describes in the book, on the corner of the main road to Saint-Satur and Sancerre and a small road that runs along the river, the Quai de la Loire. 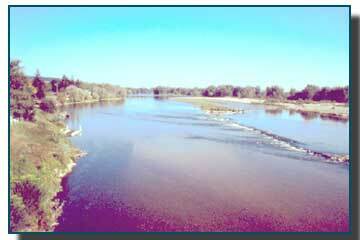 It is already perceptible while walking on the bridge, coming from the station in Tracy. It is a rather large building. It is not very clear which part of the building existed already in 1930. In 1940 the bridge and the right side of the building, looking at the front, were destroyed by a German bombardment. "La Providence" The "Nettle lane"
This information could be important to determine the exact position of the "nettle lane", that plays such a essential role in the story. In fact the building consists of two parts. On the left, from the street corner on, along the Quai: the hotel. Next to the hotel a small English style pub that is no part of the hotel. Than a small street being the "nettle lane" or a successor of it, and on the other side of the "nettle lane" an enwalled, rather large, property. It is conceivable that the pub was constructed later, after the destruction of part of the hotel in the war. The "nettle lane" would have been wider then, which is likely because in the novel it is mentioned that there were large oak trees in it. There are no trees anymore to-day. 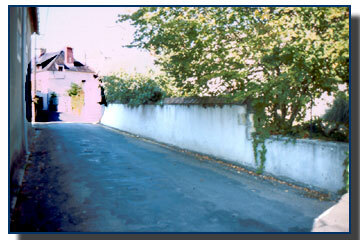 The "Nettle lane" and the wall of de St.Hilaire's property Maigret's room window, looking out on the lane? The small street doesn't lead to a dead end. 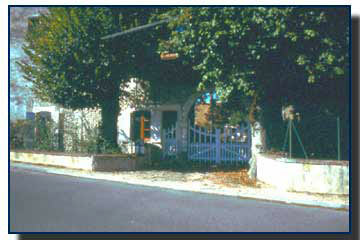 It comes out on the main road to Saint-Satur and Sancerre. A few windows of the hotel, behind the pub, look out on the lane. One of these could be the window Simenon had in mind for Maigret's room in the story. 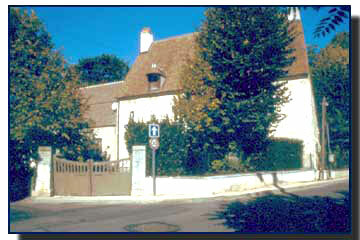 Across the "Nettle lane", coming from the hotel, was the mansion of Tiburce de Saint-Hilaire. In fact, there is a rather large property on that spot. It's not a castle nor a real mansion. 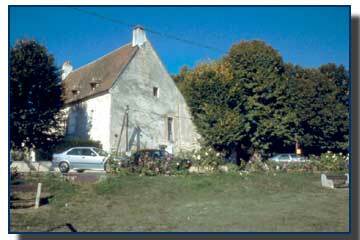 It's a large house with several outbuildings, likely to have been a manor-house. 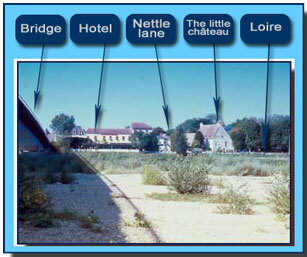 Even if those houses weren't there in 1923 the total length could not have been more than 200 m (218 yd) because there is a lock connecting the Canal latàral de la Loire with the river itself. Probably the author was inspired by the actual circumstances and the positions of the buildings, but used another property that he had in mind for the sake of the story.